The Motivation Manifesto by Brendon Burchard has just been released. He is giving out a few thousand copies of his new book to those looking to find greater clarity, courage, and motivation in their life. 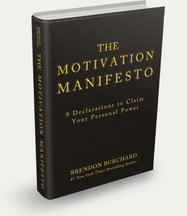 New York Times bestselling author Brendon Burchard has just released The Motivation Manifesto: 9 Declarations to Claiming Your Personal Power, a new book written to help anyone find greater clarity, courage, and motivation in their life. Brendon has also announced that he will be sending out free copies of The Motivation Manifesto to anyone that requests a free copy here. Inside the book, readers will be able to discover the main motive to humankind, which is the pursuit of greater personal freedom. We all want more freedom to do the things we desire most and spend more time with the ones we love. However, there are two obstacles that stand in our way to achieving this freedom. Recognizing those obstacles and facing them head on are the first steps to freeing ourselves and taking back our lives to obtain our personal freedom. Burchard says this book is about “what really motivates us — about the Personal Freedom to be ourselves, alive and spontaneous, joyous and grateful, powerful and extraordinary… about chasing our dreams courageously despite fear, insecurity, and distraction. The book never uses the word “I” but rather “we,” as if it were a manifesto for all of us, for our real and important struggles, for humanity and freedom. For those looking for greater clarity, courage, and motivation in their life, who want that personal freedom and a more meaningful life, should grab a free copy of Brendon Burchards The Motivation Manifesto while it’s still available.